In this episode we’ll revisit the subject of jQuery and AJAX as the current episodes on these topics are a little out of date. This episode will be a little more beginner-focussed but it’s still an interesting topic so let’s get started. 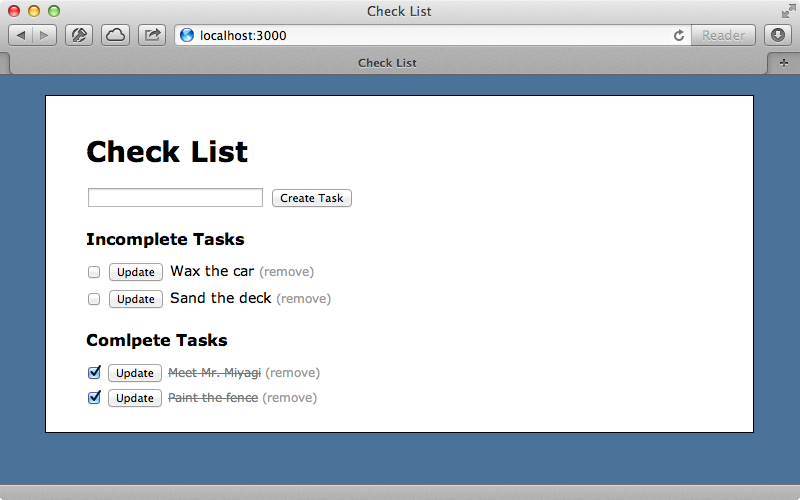 We have a simple task list application where users can create tasks, mark them as complete or remove them. Each of these actions requires the page to be fully reloaded. Our goal is to add AJAX so that this can be done without a page reload. This element also has a data-method attribute which means that a DELETE request will be sent when the link is clicked instead of a normal GET request. If you’re curious about how this all works you can find this file on Github where we’ll find the code that adds the functionality to add link with a data-confirm attribute. A similarly useful attribute is called data-remote. This will help us a lot when we add AJAX functionality to our application. 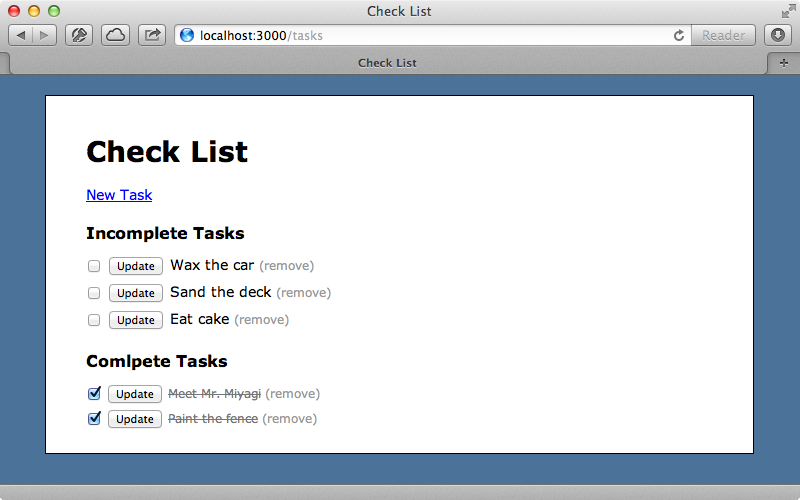 The first change we’ll make is to the “New Task” link so that it adds the form for a new task inline using AJAX. To make this link work with AJAX we just have to add a remote option and set it to true. Now when we click the link it’s instantly replaced by the form for adding a task. When we submit this form, however, it does a full page reload as the form isn’t configured to submit its data through an AJAX call. This is easy to fix: we can modify the partial where we render the form and add the remote option. 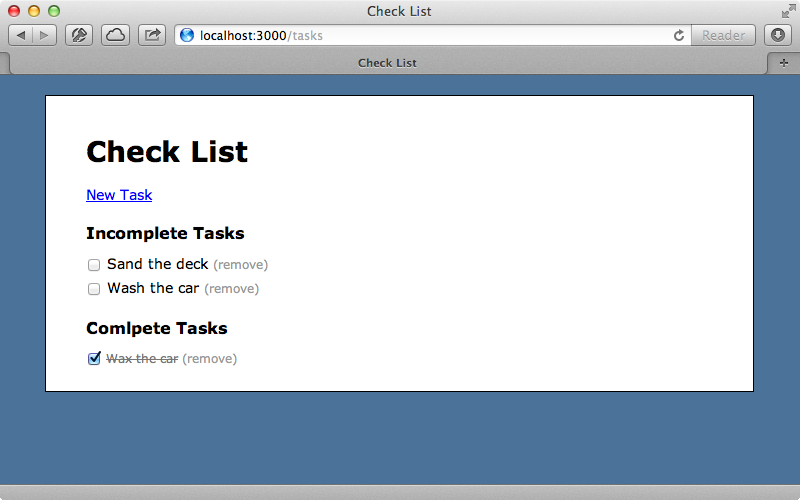 Now when we create a new task it’s all done without the page being reloaded. We can easily repeat this process for the “remove” links as removing a task currently reloads the page. This link is in the task partial and first we need to add the remote option to it. Now when we click the “remove task” link and confirm it the task is removed without the page reloading. When we reload the page now the alert shows so all we need to do now is replace the alert with code to submit the form. To do this we call $(this) to get the current element, i.e. the checkbox that’s been checked, then call parent on that to get the parent form. Calling submit() on this will submit the form. We also want to remove the button on each form and we can do this getting the input elements with a type of submit and calling remove on them. When we reload the page now the buttons have disappeared and if we check one of the checkboxes next to an incomplete task the form is submitted and the task is marked as completed. This works the other way, too. 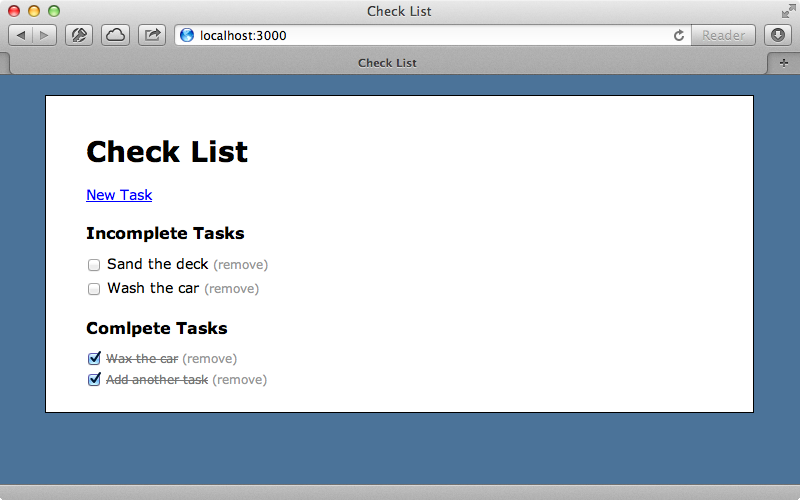 Unchecking a completed task will submit the form and move it back to the incomplete tasks list. We just need to AJAX-enable this form now so that the whole page isn’t reloaded when a task is moved. Again we do this by marking the form as remote. We’ve been using a lot of jQuery functions in this episode. We can find documentation for all these on the jQuery Documentation site and we can find the appendTo function’s documentation in the Manipulation section. Getting this to work is fairly easy. We can create a plugin by calling jQuery.fn and the name of our plugin and we set this to a function. Inside this function we can reproduce the functionality we had earlier. The only difference is that instead of hard-coding the name of the form in the selector we use this to get the form elements that the plugin was called on. Note that the function returns the forms at the end so that we can chain other elements onto our selector. With this code in place we can change the create template where we render out a new task. This creates the form that we want to add our plugin’s functionality to and all we need to do is call submitOnCheck on the form immediately after we create it. 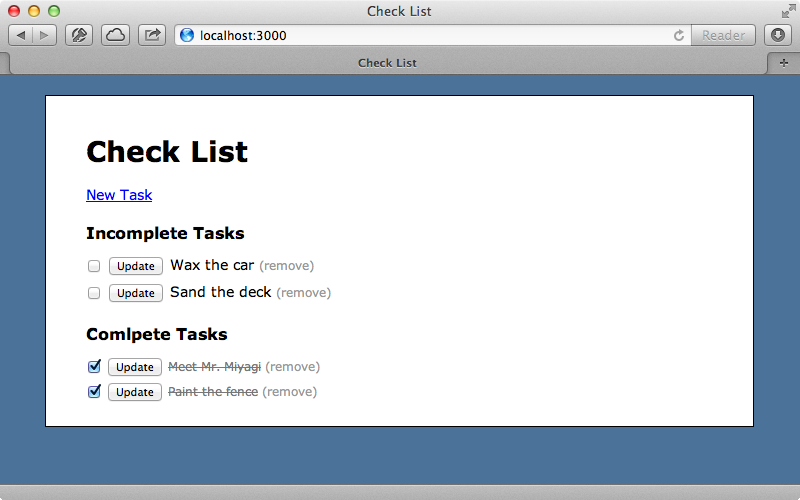 Now when we create a task it’s “update” button is hidden and checking its checkbox moves the task to the Completed list. If you’re interested in learning about CoffeeScript episode 267 covers getting started with it.